Oh the geek fashion train did not slow down for November. 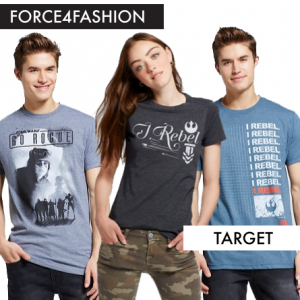 Force4Fashion is back for Rogue One with a line of t-shirts being sold through Target. Four of the ten shirt options were designed by Rogue One: A Star Wars Story cast and crew members: Gareth Edwards, Felicity Jones, Riz Ahmed, and Diego Luna. Each shirt retails for $12.99 online and in stores with $5 of each sale going to UNICEF in support of UNICEF: Kid Power. These tees aren’t quite as fashionable as what came out for as part of this Force for Change charity initiative around The Force Awakens, but definite props are in order for making something that would be accessible to more fans this time around. Women’s and men’s cuts are available although each design is available in one cut or the other. Please also note for some reason the women’s sizing is in juniors but the men’s is regular men’s sizing. The shirts are slated to be available through December 31st. Hero Within debuted their first offering for ladies with the launch of a DC-licensed jewelry line. Of course there are options in it for men too. 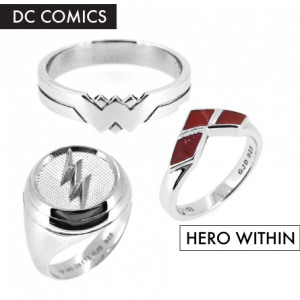 Check out the Hero Within webstore for nice subtle Wonder Woman and Harley Quinn rings as well as as Green Lantern, The Flash, Superman, and Batman rings. Cufflinks are available for some characters too. The company teamed up with Guild Jewellry Design for each of the sterling silver pieces. Prices range from $60 – $90. Also for DC, Fun put out an Ugly Sweater set. 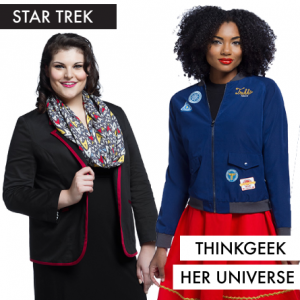 The highly-anticipated Star Trek fashion capsule collection became available on ThinkGeek‘s website. This collaboration between Her Universe and the geek goods retailer yielded a 14-piece assortment of dresses, skirts, shirts, scarves, blazers, jackets, and pins. There’s even a look book on the website for styling suggestions in the vein of holiday parties, work, and going out. Although it’s bold I like the pattern that they came up with using the Star Trek Delta. My top pick is the TOS Open-Front Blazer. It seems like the most versatile and the lining allows you to fold up the cuffs and choose hold bold or subtle you’d like the piece to look that day. Prices Prices in the collection range from $14.99 for pins to $89.99 for a Tribble Faux Fur Coat. Speaking of Her Universe too, two dress designs (Hoth and Bespin) have been modified into A-line skirts and are now available at Modcloth. ThinkGeek also now has two Star Wars blanket scarves that can be worn as subtle fandom fashion or draped to announce it out loud. The R2-D2 and C-3PO design as well as the Boba Fett one both retail for $39.99. As they are both 100% acrylic they will retain heat really really well. A new cotton span jersey Han Solo legging is online for $27.99. And a vegan leather version of Finn’s jacket from The Force Awakens can be found there for $119.99. The retailer also announced on N7 day a slew of Mass Effect apparel available for pre-order. I randomly happened upon new Star Wars socks by a company called Stance. They also launched a Disney collection this month. 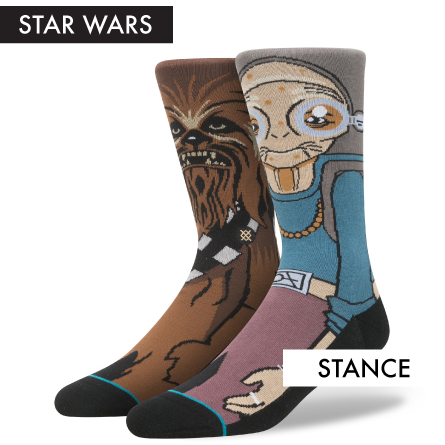 They’re not cheap at $20 a pair, but they have amusing sock pairings including a Maz Kanata and Chewbacca one. According to Parks and Cons the socks are being sold at D-Street in Downtown Disney. Fellow FANgirl contributor Linda hasn’t tried these particular licensed socks but has said in her experience other socks from the company are well-made and comfortable. It looks like the Star Wars socks are men’s sizes only though. Probably not in this movie, kiddo. 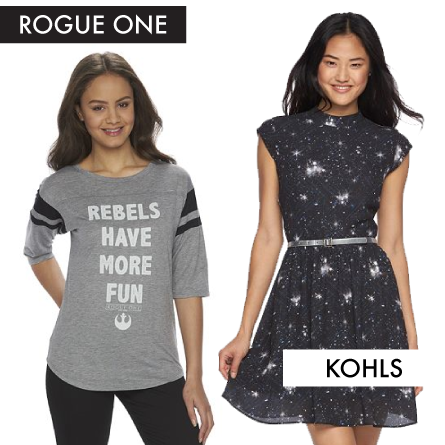 And finally the Kohl’s Rogue One juniors’ collection slowly creeped into stores. There are eleven pieces which you can now find online as well. After many tries, I finally found them in a retail location so look for a review of the line soon (update: it’s here!). I have thoughts. Price go from $30 to $58 but Kohl’s often has sales and discounts available. In the mean time, Hot Topic has come out with a few more t-shirts for Rogue One including this kind of fashionable design. During November Hot Topic also released two Doctor Who-inspired coats (an embroidered peacoat and an embroidered corduroy), a Fantastic Beasts and Where to Find Them mini-collection, and several new Studio Ghibli apparel items including a Princess Mononoke vest and a My Neighbor Totoro coat. Love and Madness announced on Instagram that they have sold out of the A New Hope crawl wrap bracelet. 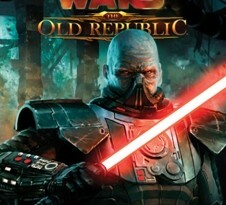 They’ve teased the upcoming Empire Strikes Back wrap bracelet. 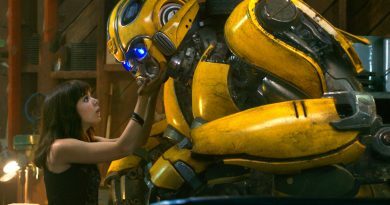 The wrap bracelet is my top pick from the Love and Madness Star Wars, Disney, and Walking Dead accessories I reviewed. Her Universe enters a new chapter as the brand has been acquired by Hot Topic. I reviewed the Black Widow holster bag from ThinkGeek. High-end designer Prabal Gurung released a Pokémon capsule collection. And this week Po-Zu is debuting their Star Wars shoe line to wholesalers at FFANY. 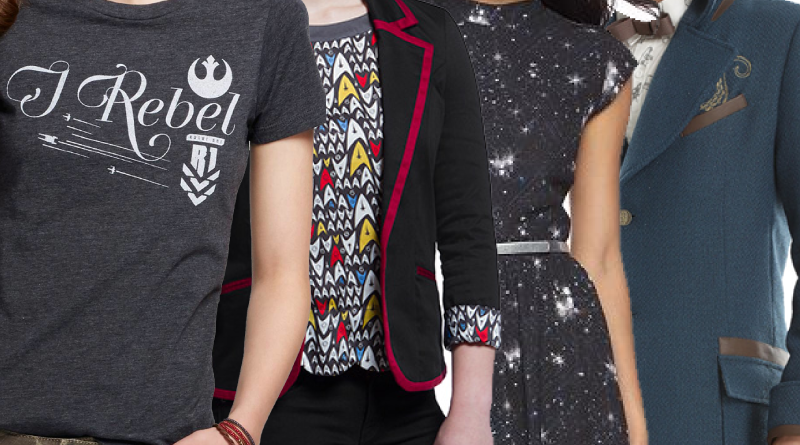 Got a new geek fashion item on your wishlist now? Let us know.